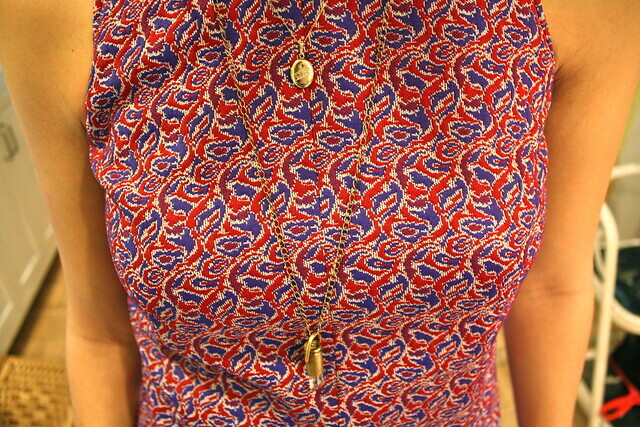 Today I wore a vintage dress with a funky pattern. I was too tired to take my picture, so Rich took it for me. He's so sweet. Cute dress! I love how you paired it with a dark blue scarf. You can never go wrong with red, white, and blue. I love the details on your dress! Ooooohhh!!! This dress reminds me so much of my youth. Or, more accurately, my aching envy of women during my youth. Such a retro -- and attractive -- pattern. You surround the dress with smart choices. Srsly? YOU WERE WITH ME WHEN I BOUGHT IT! lol. You can borrow if you want. lolol I thought it looked familiar. Well NOW I WANT IT. Aww how cute! I love the dress! I love how bright and pretty all of your indoor pics are. Very jealous over here. The pattern on your vintage dress is so cool and unique. I really love the scarf paired with it. love how you tied that scarf! Love the pattern of the vintage dress. It's quite pretty with the scarf. I love the dress, especially along with the bold colored scarf, compliments on your taste! "No one wants to kiss a girl in black"